You can register multiple email addresses for your Junecloud account to recognize. So only emails from you end up in your tracker. Here's an Apple Mail.app rule to auto-forward my Amazon shipment notifications. It just looks for the phrase "the tracking number is" then forwards and files matching messages. This rule means I don't need to think about anything to get shipments into Deliveries. 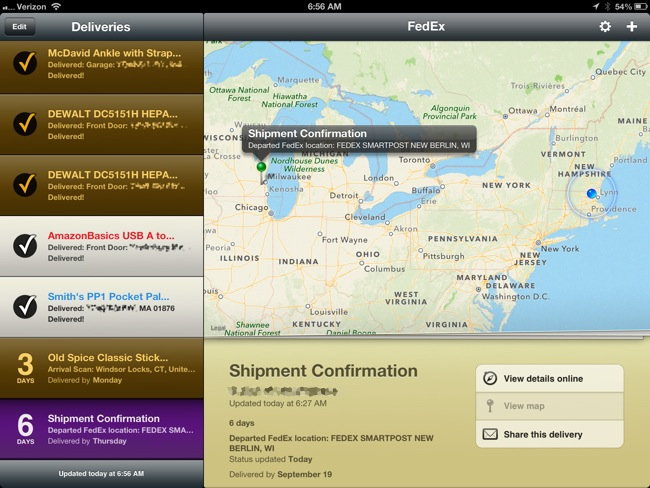 When I open the app, all of my shipments are there. We are affiliated with a variety of businesses and work closely with them in order to provide our services to users. We will only share personal information with affiliates to the extent that is necessary for such affiliates to provide the services. For example, when an ad is displayed on Junecloud, the IP address of the viewer may be shared with Junecloud's advertising partners. We require our affiliates to provide the same level of privacy protection that we do and they do not have the right to share or use personal information for any purpose other than for an authorized transaction. That's the worst bit I could find, but read it for yourself. If you are concerned about forwarding your purchasing info to someone other than your credit card company (which is probably already taking advantage of the data) you probably should stick to clicking the links in the emails.